The Defense Intelligence Agency (DIA) coordinates intelligence activities within the U.S. Department of Defense (DOD). Established in 1961, DIA has faced a number of territorial challenges both from the intelligence components of the three major armed services, as well as from other intelligence agencies. DIA, which has some 7,000 civilian and military employees worldwide, is headquartered at the Pentagon in Washington, D.C. Its director is a three-star military officer who serves as principal military intelligence advisor to the secretary of defense and the chairman of the Joint Chiefs of Staff (JCS). Despite the congressional passage of the 1958 Defense Reorganization Act, which created unified military commands, the U.S. Army, Navy, and Air Force each guarded their intelligence organizations. As a result, DOD leadership did not receive consistent, reliable intelligence, a shortcoming that contributed to the failed April 1961 invasion of Cuba. Even before that, President John F. Kennedy complained in his 1961 State of the Union speech about "a growing gap between decision and execution, between planning and reality." In February, 1961, Defense Secretary Robert S. McNamara informed JCS of his decision to create a Defense Intelligence Agency, and instructed the Joint Chiefs to develop a plan for the new organization, which began operation on October 1, 1961. The intention behind DIA was that it should serve as a tight union, rather than a loose confederation, of defense intelligence and counterintelligence activities, so as not to increase the bureaucratic layering within an already thickly populated defense intelligence community. Its director would report to the secretary of defense through JCS. Upon establishment of DIA, the services transferred various intelligence functions to it gradually, so as to maintain the pace of ongoing activities. The job of DIA would be to collect, process, evaluate, analyze, integrate, produce, and disseminate military intelligence for DOD. As DIA has admitted in its own official history, its attempts to establish itself as the central military intelligence organization within DOD met with continuing resistance from the military services during the 1960s. First, the services retained their own military intelligence organizations, and their leadership was often wary of sharing intelligence with a relative newcomer. The Vietnam War, in which DIA was tasked with helping to account for missing or captured military personnel, particularly tested the abilities of the fledgling agency. By the mid-1970s, DIA had gained considerable funding, but its budget of more than $200 million annually made it a target for congressional inquiries, particularly by the Pike Committee, the House equivalent of the more well-known Church Committee in the Senate. Within the Intelligence Community, Admiral Stansfield Turner, director of the Central Intelligence Agency (CIA) criticized DIA's inability to effectively coordinate military intelligence activities on the part of the various services. Executive Order 12036, signed by President James E. Carter on January 24, 1978, restructured the Intelligence Community and brought DIA's responsibilities into focus. The agency was subsequently reorganized into five directorates, concerned with production, operations, resources, external affairs, and J-2 (joint intelligence) support. During the 1980s, a DIA white paper series on Soviet military capabilities gained wide respect in the intelligence community. Soon after the Iraqi invasion of Kuwait in August, 1990, DIA established a 24-hour intelligence management center focusing on intelligence relating to the crisis. Some 2,000 DIA personnel participated in Operation Desert Storm, primarily through the National Military Joint Intelligence Center (NMJIC), which DIA established at the Pentagon to integrate intelligence from the war front. On the ground in Kuwait and Iraq, DIA personnel worked closely with military combat units. 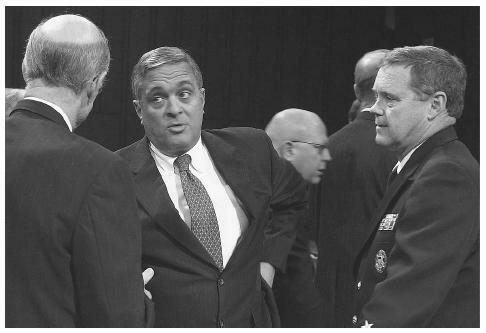 Vice Admiral Thomas Wilson, right, confers with CIA Director George Tenet, center, after Tenet's testimony before the Senate Armed Servives Committee in March 2002, to discuss the threat to U.S. interests around the world by al Qaeda. following year saw a thoroughgoing reorganization of DIA as part of the general military downsizing that followed the end of the Cold War. In October 1995, DIA established the Defense HUMINT [Human Intelligence] Service, or DHS. Though DIA was conceived as a military organization, the majority of its personnel today are civilians. The director, however, is always a three-star officer—a lieutenant general or vice admiral. (The only exceptions were General Donald V. Bennett, director from 1969 to 1972, a four-star general, and Dennis M. Nagy, a civilian who served as acting director during the fall of 1991.) In addition to the Command Element, which includes leadership and support staff, DIA consists of three major sections: Analysis, Intelligence Operations, and Support Services. Within the Analysis section are the directorates for Analysis and Production; Intelligence, Joint Staff (J2); and Policy Support. Analysis and Production manages key components of the intelligence cycle for DOD, its leadership, and its services. The directorate for Intelligence, Joint Staff (J2) supports the chairman of JCS and other uniformed leaders by providing a national-level focal point for crisis intelligence support. Within it is the Defense Intelligence Network, which operates a closed circuit DOD news network modeled on commercial news networks such as CNN, as well as INTELINK, a classified Internet. Policy Support works with the Office of the Secretary of the Defense, as well as the National Security Council and State Department. Intelligence Operations includes the directorate for Intelligence Operations and the Central MASINT Organization. These are concerned, respectively, with human intelligence and measurement and signatures intelligence. Within the directorate for Intelligence Operations is DHS, the Defense HUMINT Service. Under Support Services are the directorates for Administration and Information Systems and Services. Among the administration sections is the Counterintelligence and Security Activity, which works to counter foreign intelligence threats, conducts security and suitability interviews, and assists the Federal Bureau of Investigation and military investigative organizations in criminal and counterintelligence investigations. Information Systems and Services supports a number of activities, including the operation of the Joint Worldwide Intelligence Communications System, a high-bandwidth system that makes possible fullmotion video teleconferencing and data exchange among major intelligence nodes. In addition to these main sections, DIA also includes the Program Management directorate, under which is the Military Intelligence Board, the DIA director's advisory committee. Also outside the main sections of DIA is the Joint Military Intelligence College, which is accredited to award bachelor's and master's degrees in intelligence and strategic intelligence. Disposition of Production Records of the Defense Intelligence Agency: A NARA Evaluation. Washington, D.C.: National Archives and Records Administration, 1996. Intelligence Agencies: Personnel Practices at CIA, NSA, and DIA Compared with Those of Other Agencies. Washington, D.C.: General Accounting Office, 1996. Scanlon, Charles Francis. In Defense of the Nation, DIA at Forty Years. Washington, D.C.: Defense Intelligence Agency, 2002. Defense Intelligence Agency. < http://www.dia.mil/ > (April 14, 2003). Defense Intelligence Agency. Federation of American Scientists. < http://www.fas.org/irp/dia/ > (April 14, 2003).